Size 4'' H x 3 7/8'' diameter. 20-oz. 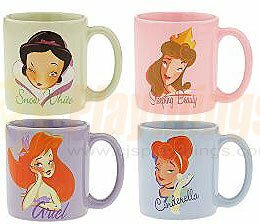 Stylized art of your favorite princesses brings a touch of royal personality to our mug set. Features Snow White, Sleeping Beauty, Cinderella and Ariel, with a witty saying for each. 4'' H x 3 7/8'' diameter. 20-oz. Ceramic. Imported. Dishwasher/Microwave safe. Wash thoroughly before use. Shipping & handling includes postal insurance. RARE Item, EXCLUSIVE IN DISNEY. Buy it now!